The ability to present an idea or argument effectively to a target audience is essential for anyone who wants to build a successful career in tax. What presentation skills should you develop? Originality: The content of your presentation should be new or different enough to engage your audience. If your topic is unavoidably mundane, you can spruce it up with images, humour or even props that present it in a new way. Structure: Your time to present is limited, so a clear structure can be an effective way of conveying complex ideas. Create a framework with patterns of logic and a sensible order (e.g. chronology or premise-argument-consequence-implication). Authority: You should have expertise in your topic and know, by heart, the way you plan to present it. Once you’ve developed the structure and words, practise your presentation. This will also help your confidence when you’re in front of your audience. The best presenters project confidence, and confidence comes from being comfortable. Body language: Stand or sit up straight and face your audience. Breathe deeply and slowly. Release the tension in your body and try to spend the time looking at the audience more than at your notes. It’s okay to pace or move around if you need to, but such movement should be measured. Voice: If there’s no microphone, project your voice loudly and clearly – clarity is crucial, with or without an amplifier. Many people rush their words when nervous, so be mindful of the flow and pace of your presentation. Include pauses, giving time for your words to sink in. Rapport: Try to build a warm rapport with your audience. Find out something about them beforehand that you can mention at the beginning. Many presenters also break the ice with a joke or an anecdote, or use techniques such as rhetorical questions. Get to know how you behave in front of an audience, accentuate the good traits and reduce undesirable habits. If you get nervous when people stare at you, it may help to use visual aids that they can look at instead. If you speak too fast, invest in a metronome to help you practise speaking at a slower pace. And if your hands tremble, hold a prop like a pen to still them. The way you present yourself, your work and your ideas will inevitably influence how your abilities are viewed in the workplace. 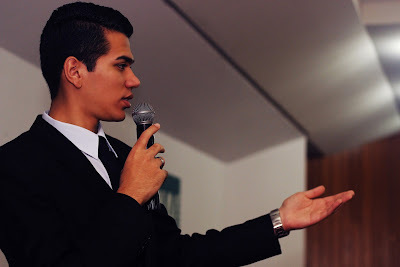 Give your career the best chance by honing your presentation skills at the beginning.